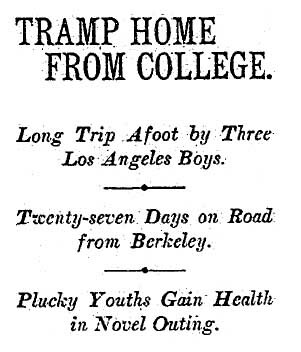 Like many young men, Stuart, Sayre and Maynard decided to walk home from school—but it was a bit farther for these college friends because they were going to Berkeley. It was apparently an uneventful trip aside from the distance—the three friends covered more than 500 miles in 27 days, leaving the morning after commencement. The traveled lightly, wearing sombreros, khaki and hobnailed boots, carrying water and packs weighing about 8 pounds, while shipping a heavier trunk ahead of them. The began in San Francisco to San Mateo, Half Moon Bay, then a detour to Santa Cruz, then Watsonville. They followed the Southern Pacific tracks from Salinas to King City. The next stop was Jolon, then Paso Robles, San Luis Obispo, Pismo Beach (then known as El Pizmo), Santa Maria, Santa Ynez, San Marcos Pass, Santa Barbara, Ventura, Calabasas, through the Cahuenga Pass to Hollywood and then Los Angeles, where they walked to their homes. “We did not attempt to rough it by camping along the way,” Stuart told The Times. “The tramp itself was rough enough, although extremely pleasant after the stiffness of the first few days had worn off. We stayed overnight at hotels and farm houses, had good beds and excellent fare. The water at some points was poor, but bottled water helped us over this difficulty. Along the way, the friends were frequently offered rides, which they always declined, and were mistaken for forest rangers, railroad inspectors and soldiers on leave. Many they met “could not understand why young men apparently well able to pay their fare should chose to walk so far for the fun of the thing,” The Times said. You might wonder what became of these three young friends. Maynard McFie died in 1958 at the age of 72, having been the director of Security-First National Bank and president of the Chamber of Commerce. Sayre Macneil died in 1961, having been a law professor at Harvard and dean of Loyola Law School. Stuart O’Melveny, who said, “We wanted a change into the open air and we thought this would be the best way to get it,” died in 1974 at the age of 85. He was president of Title Insurance and Trust Co., which was begun by his father, Henry, who founded a little law firm now known as O’Melveny and Myers.